This Nicklaus-designed golf course has quickly earned a name for itself as one of the top-rated layouts on an island of top-flight designs. Ever-present water and sand keep play interesting, but never penalizing...golfers will find the course puts a premium on strategy and finesse, rather than sheer power. Winding through a beautiful landscape of oak and pine woodlands, the Golden Bear is a fitting complement to the prestigious residential community of Indigo Run. 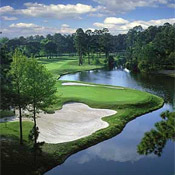 It was awarded America's Top 100 Courses Priced Under $100 for 2002 -Travel and Leisure Magazine. The Golden Bear Clubhouse includes a golf shop and casual grill. Open daily. The Golden Bear offers a state-of-the-art ProTrac GPS Electronic Caddy System on every cart. With many technological features, the system aids the golfer with full color features, such as overviews of each hole, pro tips on how to best play the hole, live scoring for groups and more!